The game is played in a rectangular field with Y-shaped goal post at both ends. The dimension of the field also varies depending on the division. Basic rule of playing is for the offense team to gain at least 10yard of field space with 4 downs (tries) else the defending team gets the ball and an opportunity to cover 10 yards in 4 downs. Common postions of players are: QuaterBack(QB), RunningBack(RB), WideReceiver(WR), OffensiveTackle(OT), OffensiveGuard(OG), Center(C), TightEnd(TE), NoseGuard(NG), DefensiveTackle(DT), DefensiveEnd(DE), LineBack(LB), DefensiveBack(DB)[CornerBack(CB), Safty(SS)]. Hyvinkää Falcons Men. Getting stronger by the season, the high and low governors is the highest men division of Hyvinkää Falcons. Helping the Falcons Juniors take flight, it stands as a destination team for the Juniors. Falcons Men will take flight again for the season with skilled player as well as rising junior players united for the love of sport. 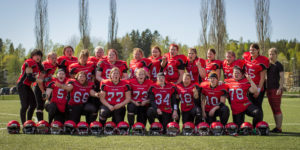 Hyvinkää Falcons Ladies. Holding steadfast at the SAJL league, the ladies of the sky awaits the season with a birds eye view. 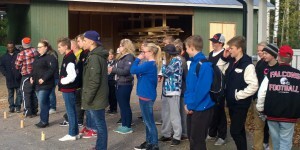 This is the highest Hyvinkää Falcons team for the Ladies and a team to look forward to joining for the Junior Ladies. Getting better each passing season, the Ladies look forward to the season for fun and victory.